The political action committee of Nevada’s leading small-business association announced its endorsement of Adam Laxalt for governor. “We have a proven fighter for small business in Adam Laxalt,” said Randi Thompson, Nevada state director forNFIB, speaking for the NFIB Nevada PAC, which made the endorsement. “He fundamentally understands that small businesses are not smaller versions of big businesses, which is what we look for most from every candidate. 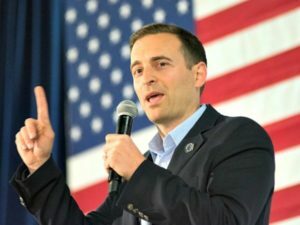 His 100-percent score on our candidate questionnaire is impressive enough, but his pro-small-business accomplishments as attorney general seal the deal with us.” Thompson listed Laxalt’s work for Main Street enterprises. —He led a coalition of 21 states challenging the U.S. Department of Labor’s, Obama-era overtime rule. Waters of the United States rule, joining a bipartisan coalition of 13 states suing to invalidate the rule. agency’s redefinition of the decades-old legal standard for joint-employer status. —He helped curb abusive litigation practices related to the ADA that had been taking advantage of small businesses. This news release can also be found on the NFIB Nevada webpage. Follow NFIB Nevada on Twitter @NFIB_NV.